Not all stars twinkle in the sky. Some glisten on the shore or wink up at us from the grass beneath our feet. Their shape is often best appreciated from above. However, I drew the Queen Anne’s Lace flower, shown at top, from the perspective of an ant that might be looking up towards the sky from a position on the stem. Star shapes consist of five or more points radiating from a centre. These star polygons are given different names depending on how many points they have. For example, a pentagram has five points while an octagram has eight. Many of these star shapes hold spiritual significance. Pentagrams are considered magical and often used in occult practices. The Star of David and the Seal of Solomon are both hexagrams, star polygons with six points. On land, the variety of star shaped flowers is endless. 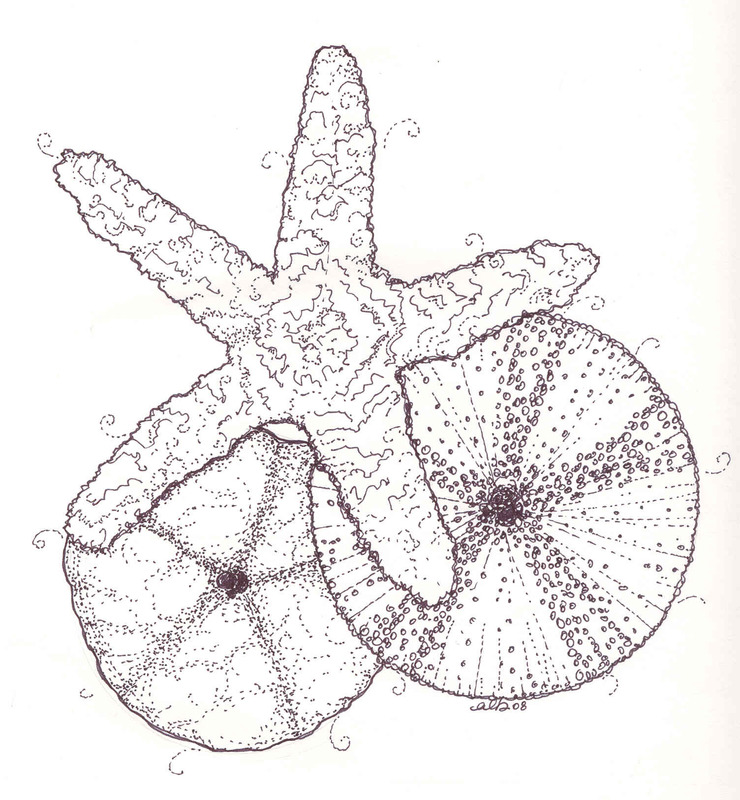 In the water, echinoderms are marine animals that reveal radial symmetry in some part of their design at the adult stage. Sea urchins, sand dollars and starfish are echinoderms that often wash up on Nova Scotia’s shores. Sometimes, the star structure of the polygon is not as obvious, as is the case with the hexagonal chambers of bees. Like other shapes in nature, such as the circle, the branch, the spiral and the meander, these tiny hexagons form exquisite patterns and are the building blocks for larger things, in this case, the honeycomb. Over the past five Saturdays, I’ve examined five different shapes found frequently in nature as a lead-in to a Summer Scavenger Hunt. Next Saturday on June 20th, Midsummer’s Eve, I’ll provide final details of the hunt. Wherever you make your home on the planet, whether you live in the city or in the country, I hope you’ll consider taking part. The spiral is a shape that has fascinated humans since ancient times. The first symbols drawn on the planet were spirals, thought to represent the sun and eternity. When one thinks of spirals in nature, univalve seashells immediately come to mind. These spirals are logarithmic, the distance between the turns increasing as the shape becomes larger. (Don’t confuse this shape with an archimedean spiral). Logarithmic spirals were called spira mirabilis ( marvelous spirals) by the scientists who first studied them. Besides seashells, this shape is also found in fiddlehead ferns in spring time, the arrangement of seeds in sunflowers and the scales of pinecones. Not all spirals in nature are static. Galaxies and tornadoes follow this shape, as do hawks in their approach to prey in flight. A look into the mathematics behind spiral shapes can lead to further study of the Golden Ratio and Fibonacci Numbers, both fascinating topics. The spiral is one of several interesting shapes that are found repeatedly in nature. These shapes often form exquisite patterns and many are building blocks for larger things. Last week I wrote about the meander. In the Saturdays between now and mid-summer’s eve, I’ll explore a number of other shapes found in nature as a lead-up to a Summer Scavenger Hunt. Details of the hunt to be disclosed June 20th. For more information on the spiral form in freshwater and sea shells, see the shell section at Drawing Conclusions. It may seem odd to be finding seashells in the snow, but a couple of days ago, I found a Northern Moon Shell while walking along the Salt Marsh Trail off Bissett Road. It was cracked, most likely by a seagull that had broken it open, either with its bill or by smashing it on a rock. Moon snails are carnivores that bore their way into other seashells such as clams using a rasplike tongue. If you’ve ever picked a clam shell on the beach that has a small, perfectly circular hole in it, it was likely eaten by a moon snail. The live body of a moon snail is surprisingly large and covers most of the shell when it’s on the prowl. The shell itself can be up to 7 inches wide. Seagulls probably consider them well worth the trouble of cracking open, as their meat would provide a hearty meal. As a collector of seashells, I’ve always looked for the ideal specimen while walking along the shore: a flawless shell that’s a prime example of its species. Strong waves and stones often damage delicate shells and wear them down so that many of the ridges are worn and surfaces cracked by the time they wash up on the beach. Yet, Rainbow Haven beach has offered up perfect moon shells and dogwhelks over the years, and I’ve found some beautiful urchins on the nearby shores of Silver Sands. A couple of years ago, my friend Ruth brought me some shells from a trip she made back home to the south shore of Nova Scotia. Although she included some perfect specimens, some worn shells were also part of the collection that she had beautifully arranged in a large glass jar. When I decided to draw them one day, it was the worn shells that seemed most interesting. One shell in particular was just a skeleton of its former self , yet it proved to be the most appealing subject of all. It was one that I did not quickly grow tired of drawing over and over again. Why? Maybe it’s because I’m getting older and can identify more with the worn out and frayed, but as time goes on, it seems that the imperfect holds greater appeal to me from an aesthetic perspective. Not just worn seashells but trees in an obvious state of decay are also more attractive, as is my gravel driveway with the grass growing up the middle. The vines on my house continue to cover up more and more of the ‘clean white’ siding. Though they look gnarly in the winter, during the summer, their green leaves are so refreshingly beautiful… perhaps even more so, because I know they won’t last. The grass withers, the flowers fade… Would something not be lost if the grass was always green and flowers were always in full bloom? Flower beds that are ‘still in the works’ hold the promise of new plantings and arrangements in the growing season ahead. I know this long, cold winter will make the sun and sea breezes feel even warmer as I’m hanging the laundry on the clothesline this summer. My favorite seashell is a small cockle with smoothly worn ridges that my oldest son picked up on the beach and gave me when he was a toddler over two decades ago. To me, it embodies the ephemeral wonder of children and the wearing of time and the elements on all that is alive on the planet. It also holds the promise of more days spent roaming sparkling shores in search of the perfectly imperfect specimen. Although winter isn’t over yet, today’s calm and sunny weather looks ideal for beachcombing. Winter storms often wash natural treasure in the form of seashells onto the beaches. Some common finds at local beaches are shown at left: a Green Sea Urchin, Blue Mussels, Sea Biscuits (a type of Sand Dollar), a small Surf Clam, Irish Moss seaweed and a small starfish. There’s a large bed of Blue Mussels at nearby Rainbow Haven Beach that’s revealed only at low tide. The tidepools are ideal places for finding some of the creatures that prey on the mussels, such as Dogwhelks and Northern Moon Shells. Sometimes, a Rock Crab that’s managed to hide from the hungry seagulls can also be found. Many of the rocks in the mussel bed are covered with algae, making them very slippery to walk on. Periwinkles feed on the algae and are also numerous in some spots. The carnivorous Northern Moon Shell is shown at left along with a Mermaid’s Purse, which is an egg case for a skate, a type of ray. The hooked ends of these egg cases cling to seaweed but are sometimes loosened by the currents and washed ashore. 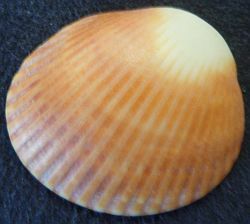 The moon shells are very beautiful but have become less common finds in recent years. Whenever I find shells with live animals still inside them, I’ll throw them back into the water. It’s such a shame to find a pile of live molluscs dying in the parking lot, picked off the beach by children but discarded by parents prior to getting into their vehicles at the end of the day. It might seem like a small thing, but in the summer, when so many people frequent the beaches, this thoughtless act is repeated enough times to have an effect on the fragile ecosystem. Though live molluscs are a wonder to find, in this instance I think it would be less cruel to just love them and leave them. A live Sea Urchin is covered with spines which hide the star shape that is only revealed upon its death, at which time the spines become dry and fall off. These urchins are greatly enjoyed by seagulls at low tide. Although they’re commonly found on the shore, I’ve also found urchin shells in the woods where they’ve been dropped from the sky by gulls hoping to crack them open on rocks. Starfish are known for their amazing ability to grow back an appendage should it be lost. There is an eye spot at the tip of each arm so that the Starfish can see ahead regardless of which arm is leading its direction. The mouth is located beneath its central disc. A carnivore, the Starfish will use its strong arms to open mussel or clam shells. Once the shell is opened, the starfish pushes its stomach through its mouth right into the bivalve it is eating. The Sand Dollars found on our local beaches are of the Sea Biscuit variety. While living, they are covered with thousands of soft brown hairs. These hairs fall off and the shell is bleached white by the sun once the Sand Dollar dies and is washed ashore. Although the top of the Sand Dollar has a flower shape on it that looks like a Christmas Poinsettia, a look at its underside will reveal a delicate yet distinct 5-point star shape.